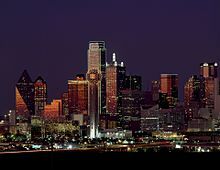 Downtown Dallas is the Central Business District (CBD) of Dallas, Texas USA, located in the geographic center of the city. The area termed "Downtown" has traditionally been defined as bounded by the downtown freeway loop: bounded on the east by I-345 (although known and signed as the northern terminus of I-45 and the southern terminus of US 75 (Central Expressway), on the west by I-35E, on the south by I-30, and on the north by Spur 366 (Woodall Rodgers Freeway). The square miles, population and density figures in the adjacent table represent the data for this traditional definition. However, the strong organic growth of Downtown Dallas since the early 2000s and continuing into the present has now resulted in Downtown Dallas, Inc.'s expansion of the term "Downtown" to include the explosive growth occurring immediately north of the Woodall Rodgers Freeway in the Victory Park and Uptown/ Turtle Creek Districts as well as past Central Expressway to the east in the Deep Ellum and Bryan Place Districts, past Interstate 30 to the south with the Cedars District, and jumping over Interstate 35E to the west to include the Design District and Lower Oak Lawn. In total there are 15 districts that now form the definition of "Downtown". "Downtown Dallas" is now viewed as an interconnected grouping of dense and urban center city districts, that while unique in their own right, also share strong urban linkages to each other and collectively participate in their role as Downtown Dallas. Downtown Dallas achieved notoriety on November 22, 1963, with the assassination of President John F. Kennedy. Both President Kennedy and Texas Governor John Connally (who survived) were shot as their motorcade passed through Dealey Plaza in what is now the West End Historic District. Part of the former Texas School Book Depository is now the Sixth Floor Museum, with exhibits about Kennedy and the assassination. Nearby is the John Fitzgerald Kennedy Memorial. The building boom of the 1970s and 1980s produced a distinctive contemporary profile for the downtown skyline influenced by nationally prominent architects. At the same time, the establishment of the West End Historic District in the 1980s preserved a very large group of late 19th century brick warehouses that have been adapted for use as restaurants and shops. With the construction of the Dallas Center for the Performing Arts in the Arts District of Downtown, Dallas will be the only city in the world that has four buildings within one contiguous block designed by four separate and distinguished Pritzker Architecture Prize winners. The area is undergoing a transition as dozens of residential conversions and new high rise condos bring more permanent residents to the downtown area. (See: North Central Texas Council of Governments (NCTCOG).) As of, 2017 there were approximately an estimated 10,766 people. Its redeveloped Main Street has recently become more of a place for Dallasites to play after several restaurants, Hotels, and residential towers opened their doors along the strip. Downtown's growth can partially be attributed to Dallas Area Rapid Transit's (DART) three (soon to be 4) Light rail lines and the one commuter line that run through Downtown and an aggressive stance taken by the city to drive development at all costs. The city has invested $160 million of public funds in downtown Dallas for residential development that attracted $650 million of private investment. Downtown Dallas as seen from Lake Cliff in Oak Cliff. Two of the first new-construction office building projects downtown in over 20 years broke ground in 2005—One Arts Plaza, a 24 story mixed use office, retail, residential development in the Arts District which is the new home of 7-Eleven's World Headquarters; and the vibrant 17 story Hunt Consolidated office building, with its spectacular state-of-the-art LED exterior lighting, which is the national headquarters for and fully occupied by Hunt Oil. Additionally, the $200 million 42-story Museum Tower residential skyscraper in the Downtown Dallas Arts District was completed in 2013. Importantly, The Trinity River Corridor is poised to undergo a significant transformation (the Trinity River Project) into a giant urban park. The park is expected to include an equestrian center, lakes, trails and three bridges designed by Santiago Calatrava. Funding over the years, however, has been a constant problem. Though serious work on the project now appears eminent, with the first two bridges having received significant private backing. Downtown Dallas has undergone a series of important changes that city officials believe will drastically improve the city's core. These changes are located in four downtown areas: Victory Park, the Arts District, the Trinity River, and the Convention center corridor. Victory Park, named one of the nation's most successful Brownfield reclamation projects, is home to the American Airlines Center, built in 2001, as well as several new high-rise hotels, residential towers and office buildings including the 33 story "W Dallas Victory Hotel and Residences" (2006), the 28 story "Cirque" residential tower (2007), the 29 story "The House" residential tower (2008), the 20 story "One Victory Park" office tower (2009), among others. Also currently under construction in Victory Park is the new "Perot Museum of Nature and Science", a $185 million 14 story ultra-modern addition to Downtown Dallas that opened in late 2012. The Dallas Arts District, already one of the world's largest, recently completed the final stages of a massive ten year construction project that resulted in a 2,300 seat opera house, a series of theaters, residential space, retail, parks, and a gleaming 42 story residential tower known as Museum Tower that opened in 2013. One of the prominent attractions in the Arts District is the Dallas Museum of Art. Of all the changes in downtown Dallas, the Trinity River corridor is undergoing the most dramatic. 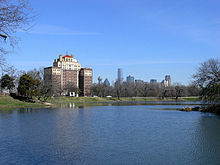 Currently the river runs in an artificially straight line a large distance from any part of downtown; however, Dallas is currently in the process of returning the river to its natural course, creating two large lakes to border the downtown area, and has commissioned two large cable stayed bridges to be built across the river and new lakes. Dubbed the Trinity River Project by local officials, plans are also in place for improved levies to protect downtown from possible flooding. Separated from Victory Park and the Arts District by the Downtown Central Business District, is the Convention Center corridor, which hosts the over 2,000,000 square foot Dallas Convention Center. The Omni Dallas Hotel is a new 23-story convention center hotel that opened in 2011. Dallas hopes these changes will bring more permanent residents into the downtown area; as of the 2010 Census the downtown population has grown to 5,291 from the 1,000 citizens who lived in downtown at the end of the 20th century. The City of Dallas, along with several non-profit organizations, constructed a $110 million urban deck park over Woodall Rodgers Freeway to create a physically seamless Uptown/Downtown District; the urban deck park opened in 2012. The 5.2 acre urban green space, named the Klyde Warren Park, further strengthens the existing synergy between the Uptown real estate market and the booming development occurring in the Downtown Dallas Arts District which together help further the continuing growth and redevelopment of Downtown Dallas. The park is often called an "urban oasis" due to its unique location and features. 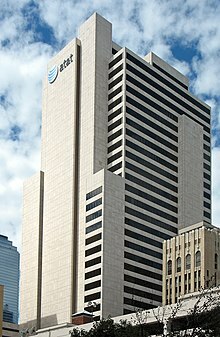 AT&T is headquartered at the Whitacre Tower in Downtown Dallas; AT&T moved to Dallas from San Antonio, Texas in 2008. Mayor of Dallas Tom Leppert said in 2008 that he hoped that AT&T would stay in the central city. Comerica is headquartered in the Comerica Bank Tower. TM Advertising has its headquarters in the same building. Tenet Healthcare is headquartered in the Fountain Place building in Downtown Dallas. The company announced in 2008 that it was moving from the northern suburban areas of Dallas to Fountain Place due to high gasoline prices and the revitalization of Downtown Dallas. Belo and A. H. Belo have their headquarters in the Belo Building. 7-Eleven has its corporate headquarters in the One Arts Plaza building. Energy Future Holdings Corporation has its headquarters in the Energy Plaza complex. Greyhound Lines is located at 350 North St. Paul Street. The Dallas Morning News has its headquarters in Downtown. Neiman Marcus has its headquarters in One Neiman Square in Downtown. The Trammell Crow Company has its headquarters in the Trammell Crow Center. 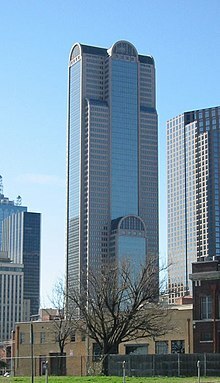 The KPMG Centre in Downtown Dallas has the Dallas offices of KPMG and Sidley Austin. Which Wich? has its headquarters in Downtown Dallas. Deloitte LLP has its offices in the JPMorgan Chase Tower. Downtown Dallas is surrounded by a major highway loop composed of, from the north and clockwise, Spur 366 (Woodall Rodgers Freeway), unsigned Interstate 345 (connecting U.S. Highway 75 (Central Expressway) to the north and Interstate 45 to the south), Interstate 30, and Interstate 35E. The loop is the center of Dallas's hub-and-spoke highway system which can be likened to a wagon wheel. U.S. Highway 67 is carried through downtown on Interstate 35E to the south and Interstate 30 to the east, and U.S. Highway 175 and the Dallas North Tollway join with other major highways within a mile of downtown. Downtown is the center of the DART light rail system. The Blue and Red light rail lines run through, from south to north, Convention Center, Union, West End, Akard, St. Paul, and Pearl stations. The Trinity Railway Express commuter train, which connects downtown Fort Worth with downtown Dallas, terminates at Union Station. Union Station also has Amtrak service, with trains connecting to Chicago and Los Angeles. The McKinney Avenue Transit Authority (MATA) operates the M-Line, a free trolley service that runs down St. Paul Street from Uptown and terminates at Ross Avenue. North from downtown, it travels to McKinney Avenue from St. Paul, runs through the LoMac neighborhood, and finally loops around the West Village along Blackburn and Cole Avenues. A spur adjacent to the West Village runs to Cityplace Station. Greyhound Lines operates a terminal at 205 South Lamar Street. DART operates the West and East Transfer Centers as hubs for its public bus system. The Denton County Transportation Authority (DCTA) operates an express commuter bus route that serves two stops in Denton, one stop in Lewisville, and another that makes two stops, one in Denton and another in Carrollton. The Dallas Pedestrian Network is a system of grade-separated walkways covering thirty-six city blocks under downtown Dallas. The system connects buildings, garages and parks through underground tunnels and above-ground skybridges. The network contains an underground city of shops, restaurants and offices during weekday business hours. The Dallas CBD Vertiport, located at the south end of the Convention Center, is claimed to be the world's largest elevated heliport/vertiport. The facility has two 60 x 60 ft. (18 x 18 m) concrete helipads and 169,000 square feet (15,700 m2) of flight deck, and is capable of handling tiltrotor aircraft such as the Bell Boeing V-22 Osprey. D Magazine, Dallas Morning News, WFAA, and KDFW are headquartered in Downtown. Dallas City Hall is located in Downtown Dallas. The Texas Fifth District Court of Appeals is located in the George L. Allen, Sr. Courts Building in Downtown Dallas. The United States Postal Service operates the Downtown Dallas Post Office at 400 North Ervay Street. J. Erik Jonsson Central Library, the largest and main library of the Dallas Public Library system, is located downtown. Downtown Dallas is served by the Dallas Independent School District. Three schools: Booker T. Washington High School for the Performing and Visual Arts, Dr. Wright L. Lassiter Jr. Early College High School at El Centro College, and the Pegasus School of Liberal Arts and Sciences are located in downtown. The Pegasus Complex is also in downtown. The neighborhood schools for Downtown are outside of the loop. Almost all of Downtown (inside the loop) is zoned to Ben Milam Elementary School, with a small section zoned to Ignacio Zaragoza Elementary School. All residents of Downtown (inside the loop) are zoned to Alex W. Spence Middle School and North Dallas High School. City Park Elementary School in Cedars served southern parts of Downtown until it closed in 2012. Other elementary schools that formerly served Downtown include Martin Luther King Jr., Sam Houston, and Esperanza "Hope" Medrano. Middle schools formerly serving sections include Billy Earl Dade and Thomas J. Rusk. James Madison High School formerly served parts of Downtown. Luna Academy, a K-3, 6 charter school of Uplift Education, is in Downtown Dallas. It used to be called Laureate, but there were other schools with the name and if they did not change it they would have been sued. Residents are also served by First Baptist Academy of Dallas, a college preparatory Pre-K through 12 school located in the city center district of downtown Dallas. Holy Trinity Catholic School is a nearby centrally located private school providing early education to three-year-olds through eighth grade. It is supported by the Roman Catholic Diocese of Dallas. El Centro College of the Dallas County Community College District is in downtown. The University of North Texas, located 40 miles (64 km) to the northwest in Denton, opened a law school downtown. The University of Texas at Arlington, Texas A&M University-Commerce, and University of North Texas offers degree programs at the Universities Center at Dallas located in downtown. Southern Methodist University is a private research university located in Highland park. ^ "Downtown Dallas, Inc". Downtown Dallas Inc. Retrieved February 24, 2016. ^ "Downtown Dallas 15 Distinct Districts". Downtown Dallas Inc. Retrieved February 24, 2016. ^ "Downtown Dallas Demographics & Statistics — Employment, Education, Income Averages in Downtown Dallas — Point2 Homes". www.point2homes.com. Retrieved 2018-03-11. ^ Godinez, Victor and David McLemore. "AT&T moving headquarters to Dallas from San Antonio." The Dallas Morning News. Saturday June 28, 2008. Retrieved on June 18, 2009. ^ "Contact Us Archived April 21, 2009, at the Wayback Machine." Comerica. Retrieved on April 19, 2009. ^ "Comerica to move headquarters to Dallas from Detroit." Northwestern Financial Review. April 1–14, 2007. Retrieved on April 17, 2009. ^ Hethcock, Bill. "Large ad agency cites area's vibrancy in decision to return." Dallas Business Journal. December 9, 2007. p. 2. Retrieved October 17, 2010. ^ Brown, Steve. "Tenet Healthcare moving to downtown Dallas' Fountain Place." The Dallas Morning News. Friday August 8, 2008. Retrieved on December 8, 2009. ^ "Contact Us Archived 2010-03-09 at the Wayback Machine." Belo. Retrieved on November 21, 2009. ^ "Contact Us." A. H. Belo. Retrieved on November 21, 2009. ^ "Contact Archived December 12, 2009, at the Wayback Machine." Energy Future Holdings Corporation. Retrieved on November 13, 2009. ^ "Route Map Archived April 22, 2009, at the Wayback Machine." Greyhound Lines. Retrieved on May 4, 2009. ^ "Contact Us." The Dallas Morning News. Retrieved on November 21, 2009. ^ "Company Information." Neiman Marcus. Retrieved on December 7, 2009. ^ "Contact Us." Trammell Crow. Retrieved on December 16, 2009. ^ "Offices." KPMG. Retrieved on December 17, 2009. ^ "Dallas Archived December 6, 2010, at the Wayback Machine." Sidley Austin. Retrieved on December 17, 2009. ^ "Which Wich? Headquarters." (Go to Contact) Which Wich? Retrieved on February 25, 2010. ^ "Deloitte LLP Corporate Office Consolidation & Expansion in Downtown Dallas Archived 2010-01-14 at the Wayback Machine." City of Dallas. October 5, 2009. 6. Retrieved on January 15, 2010. ^ DART.org - M-Line Service. Retrieved 18 September 2006. ^ "Dallas, Texas Archived April 12, 2009, at the Wayback Machine." Greyhound Lines. Retrieved on May 4, 2009. ^ Greyhound.com - Locations : Dallas, Texas[permanent dead link]. Retrieved September 18, 2006. ^ a b "Dallas Executive Airport - Dallas CBD Heliport/Vertiport". Dallas Executive Airport. Retrieved 6 May 2018. ^ FAA Airport Master Record for 49T (Form 5010 PDF). Federal Aviation Administration. Effective 26 April 2018. ^ Home page. D Magazine. Retrieved on May 30, 2014. "750 N St Paul St Ste 2100 Dallas, TX 75201"
^ "About the Texas Fifth District Court of Appeals Archived 2010-07-25 at the Wayback Machine." Texas Fifth District Court of Appeals. Retrieved on March 9, 2010. ^ "Post Office Location - DOWNTOWN DALLAS." United States Postal Service. Retrieved on December 4, 2008. ^ "Downtown Improvement District (DID) Archived April 15, 2012, at the Wayback Machine." City of Dallas Economic Development. Retrieved on November 19, 2011. ^ "2016-17 Ben Milam Elementary Attendance Zone Grades PK-5." Dallas Independent School District. Retrieved on April 26, 2017. ^ "2016-17 Ignacio Zaragoza Elementary Attendance Zone Grades PK-5." Dallas Independent School District. Retrieved on April 26, 2017. ^ "Alex W. Spence Talented and Gifted Academy Attendance Zone Attendance Zone Grades 6-8." Dallas Independent School District. Retrieved on April 26, 2017. ^ "North Dallas High School Attendance Zone Grades 9-12." Dallas Independent School District. Retrieved on April 26, 2017. ^ "Fall 2011 City Park Elementary Attendance Zone Grades PK-5." Dallas Independent School District. Retrieved on April 26, 2017. ^ a b "2012-13 Martin Luther King Jr. Learning Center Attendance Zone." Dallas Independent School District. Retrieved on April 26, 2017. ^ "Fall 2011 Sam Houston Elementary Attendance Zone Grades PK-5." Dallas Independent School District. Retrieved on September 6, 2011. ^ "Fall 2011 Esperanza "Hope" Medrano Elementary Attendance Zone Grades PK-5." Dallas Independent School District. Retrieved on September 6, 2011. ^ "Fall 2011 Billy Earl Dade Middle School Attendance Zone Grades 6-8." Dallas Independent School District. Retrieved on September 6, 2011. ^ "Fall 2011 Thomas J. Rusk Middle School Attendance Zone Grades 6-8." Dallas Independent School District. Retrieved on September 6, 2011. ^ "Fall 2011 James Madison High School Attendance Zone Grades 9-12." Dallas Independent School District. Retrieved on September 6, 2011. ^ "Luna Preparatory Archived 2012-01-18 at the Wayback Machine." Uplift Education. Retrieved on September 6, 2011. "2020 N. Lamar Dallas, TX 75202"
Wikivoyage has a travel guide for Downtown Dallas.